You may have noticed these in the flickr slide show on my sidebar. 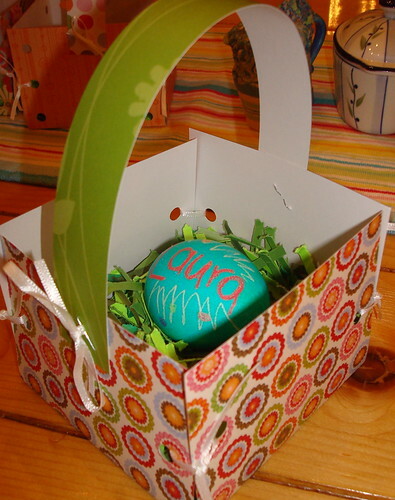 They are paper baskets that I made for Easter last year; to dress the table, act as a place card, and an Easter basket to hold yummy treats for my guests. I made them again to collect valentines for friends, so I thought I'd show you how easy it is to make them! 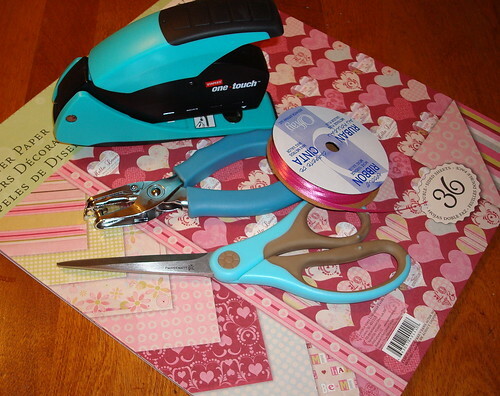 You will need paper, scissors, hole punch, stapler, ribbon and a ruler or small square tracer (not shown). I used a square pack of sticky notes to measure the square I needed to cut out from each corner. 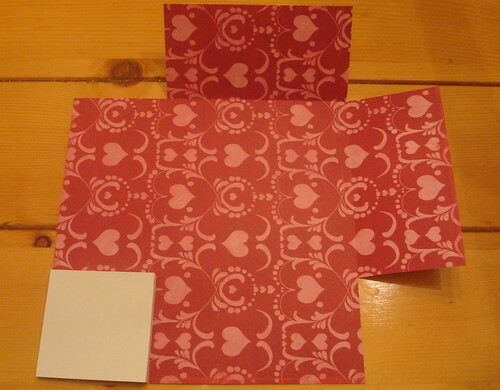 The paper I used was 12" x 12" double sided scrapbook paper and I used a 3" x 3" pack of stickies. This made my finished basket 6" x 6". 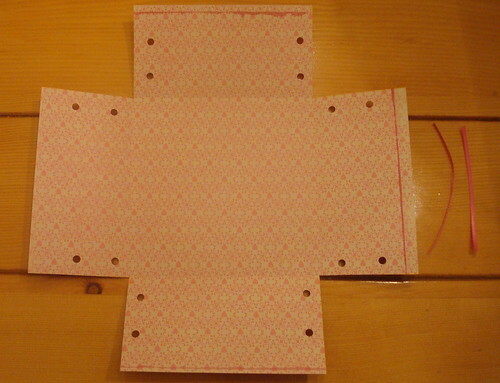 Next, use your hole punch to put holes in each of the sides. This is how you will pull the sides together. In the very first picture you can see that I only made one hole on each side, but in the background you can see another basket where I used three holes. It doesn't matter how many holes you make, as long as there are the same number on each side! ...and tie them to hold the sides together. 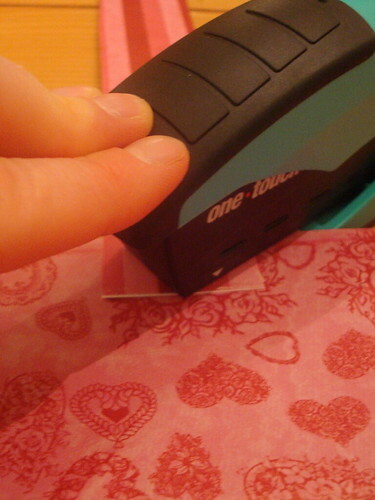 Cut a length of paper for the handle and staple it on. 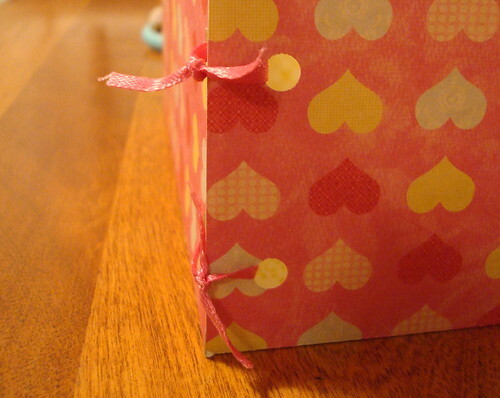 You could also make 2 holes here and tie it on with more ribbon, or staples the ribbon on and tie a bow. Be creative! And there you have it! 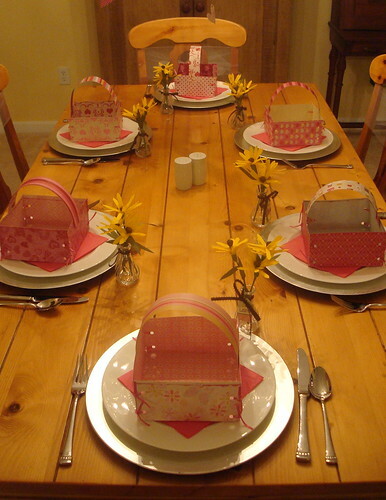 Paper baskets that dress up your table that are just waiting to be filled with valentines! 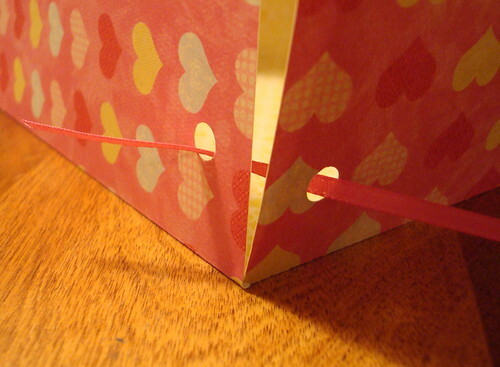 For a more shallow or deep basket: change the size of the square you cut out from each corner. *For a deeper basket (taller sides) make the square larger. This will make the bottom of your basket smaller. *For a shallower basket (shorter sides) make the square smaller. This will make the bottom of your basket larger. For a rectangular basket: start with rectangular paper. You will still need to cut a square from the corners, as this shape ensures the sides will be the same height when you fold them up and tie them together.